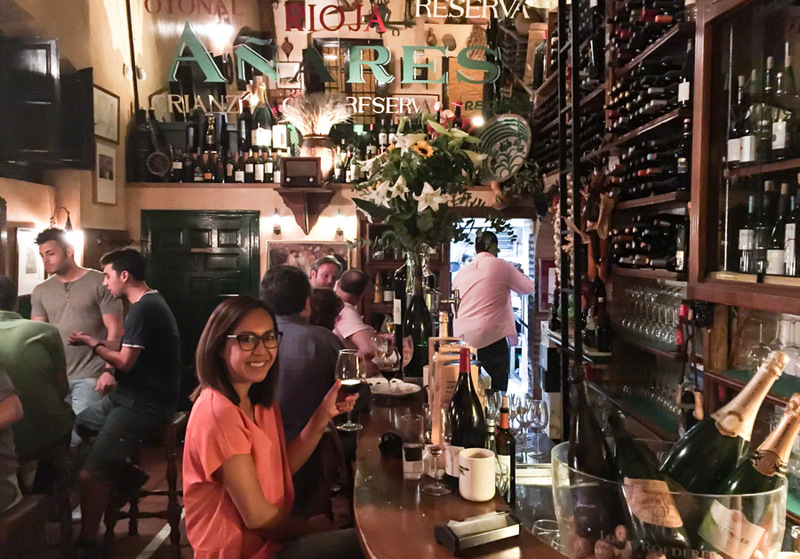 I have heard nothing but deliciously good things about Granada; it’s been on our foodie destination list for quite some time now, and you know what, Granada does not disappoint. 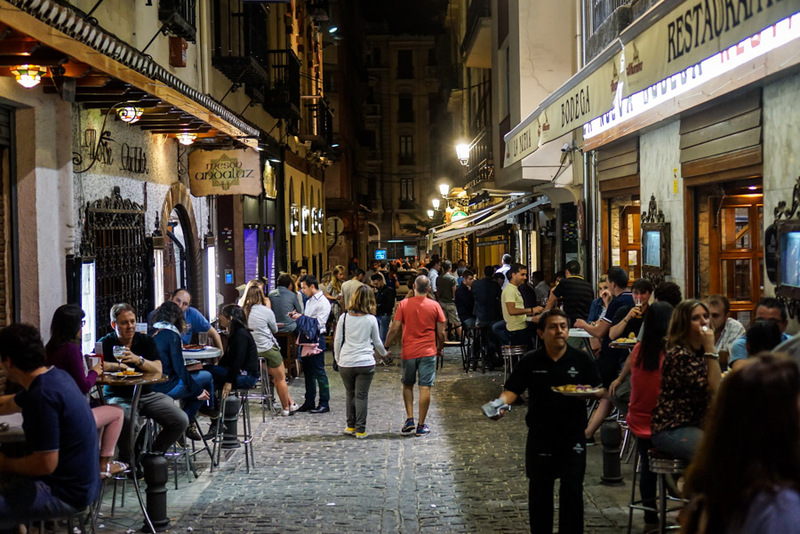 Apart from the food though, Old Town Granada is charming, boasts stunning views and the people range from happy hippies to extremely trendy and well dressed. We arrived from the Granada airport by bus after being on a plane with a stag (bachelor) party who were getting ready for a long weekend. We were staying at an Airbnb near Plaza Nueva square so we got off at the big church stop and walked from there. 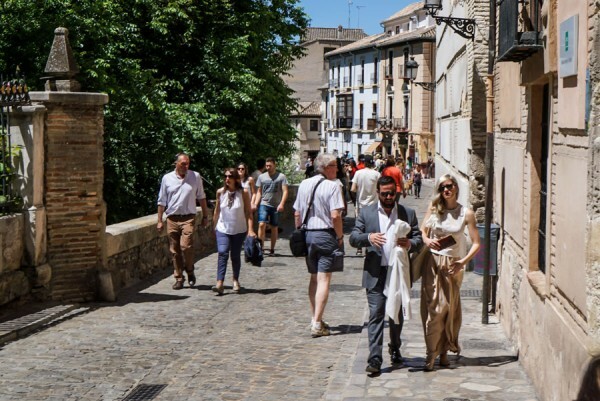 Our apartment is about 6-minutes passed Plaza Nueva up the uneven and narrow cobblestone road within the Albayzin. Imagine dragging my carry-on wheeler through all this, I nearly died imaging what I’d do if a wheel fell off; we were only half way into our trip. Thankfully, the wheel held up. Our 1-bedroom apartment was tiny. There’s a couch in the kitchen and a small dining table, a bedroom and bath, that’s it. Then again, that’s all we really needed so it suited us well, especially for $50 a night. I would have preferred to be closer to the square but this worked out especially when we hiked up to the Mirador de San Nicolas viewpoint. 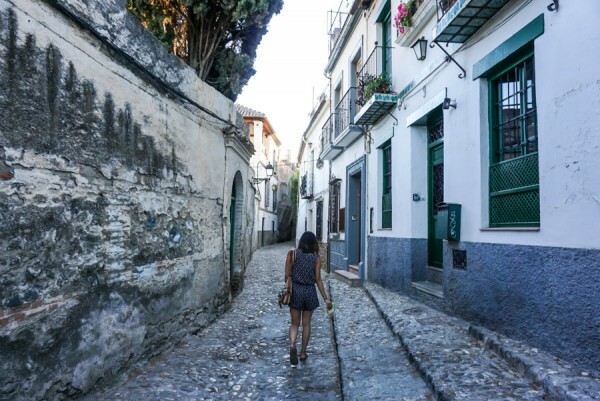 Granada is more of a city that you soak in rather than check off a sightseeing list. The Alhambra requires at least 3-hours, but it’s well worth it. 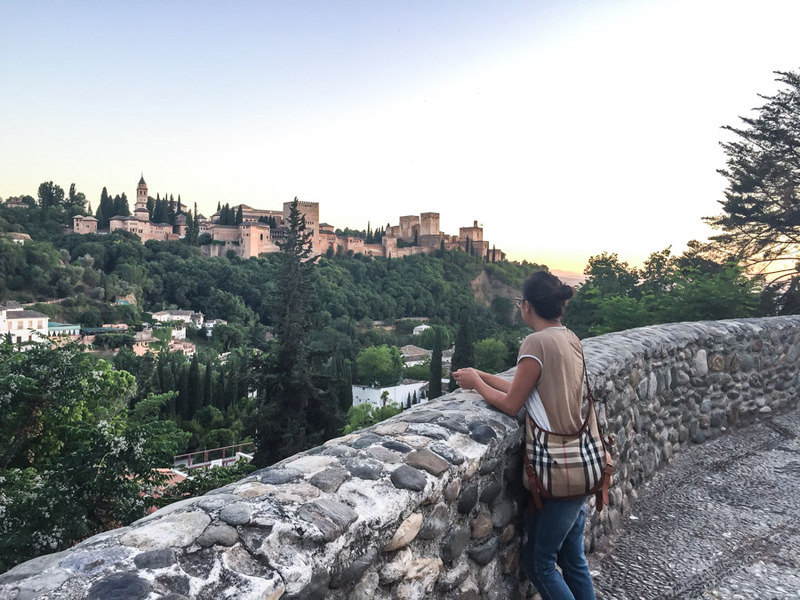 For more information and tips on visiting the Alhambra, check out our recent Alhambra post. 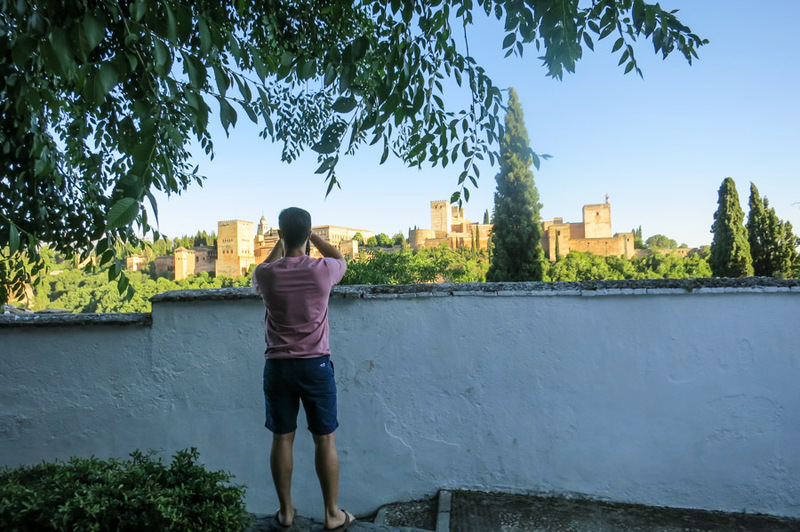 Mirador de San Nicolas is the spot to be if you want to catch the Alhambra with a view. We visited mid-day and at dawn, both were equally beautiful though dawn or sunset can be very packed. Watching a Flamenco show or paragliding over the Sierra Nevada were other recommended activities we didn’t get to try while in Granada. 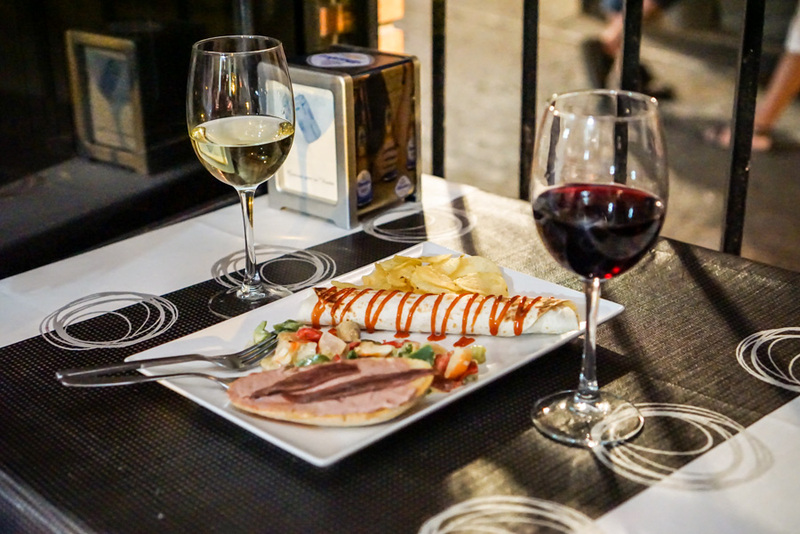 Granada is one of the few remaining cities in Spain still serving tapas on the house, with a drink purchase of course. And boy, did we drink! Here’s how it works: Head to a bar, order a drink. Some places will allow you to select your tapas dish from a menu, others will serve you whatever they please. The more drinks you buy, the more dishes they’ll bring out. 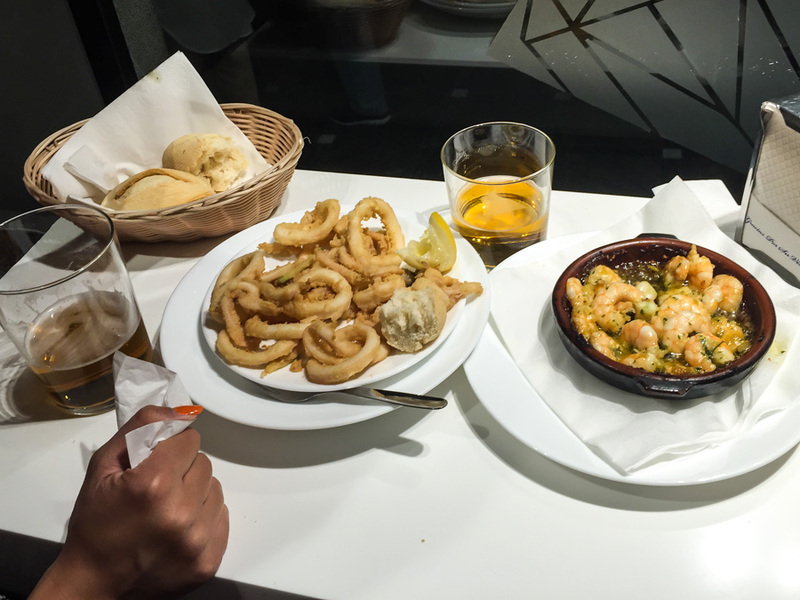 It’s generally small and basic, but if you know where to go, you can really enjoy some delicious Andalusian favorites all for free! 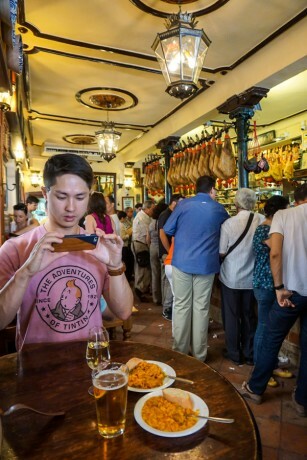 Bodega Castaneda is an institution, located on Calle de Almireceros, it’s a confusing place to find because there are about three other Bodega Castaneda-like restaurants on the same block! If you’re at a restaurant in an alley, you’re in the wrong place. Keep walking, turn the corner and look for a crowded place like this where locals and tourists alike hover for a spot at the counter. Look for the hanging Iberico. Fair warning, service is terrible and slow if you’re standing anywhere but the counter though the tapas were good. El Aguador and other restaurants in Plaza Romanilla are great for outdoor lunch and people watching. We had lunch with friends so we were able to try a variety of local favorites: grilled octopus and zucchini, paella, Spanish migas and potato croquettes. 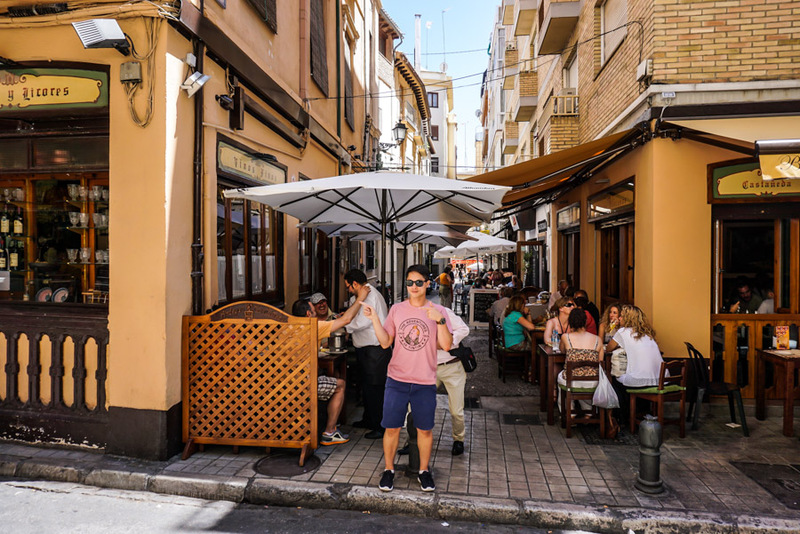 Bar Circulo is one of many tapas bars on Calle Elvira street — a happening area at night and great for tapas bar hopping. I will confess, the tapas itself weren’t that good, but the wine pours are generous. Everything in the picture below was 4 euro. Los Diamantes is the place for mouth-watering seafood tapas. 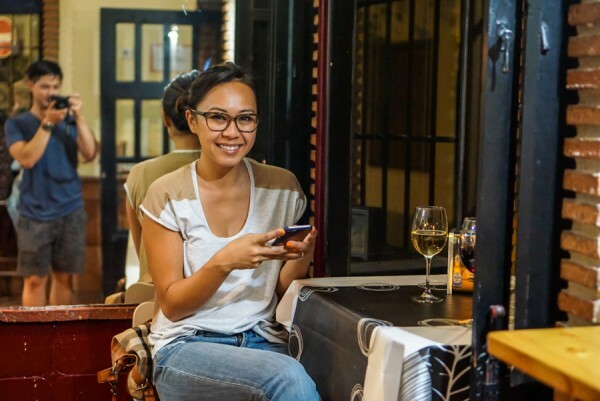 If you dine at one place in Granada, this has to be it. Don’t be intimidated by the crowd, it runs like an organized chaos. If you can manage to find a counter space to stand or a table to sit, the service will come quick. Order some beers, an assorted plate of fried seafood will be served on the house. Portions are generous, order gambas — shrimp — pil pil or al ajillo style, you can’t go wrong. Wished we had room for the razor clams and fried anchovies. Taberna La Tana is a charming, intimate and proper wine bar and seats about 10 people. 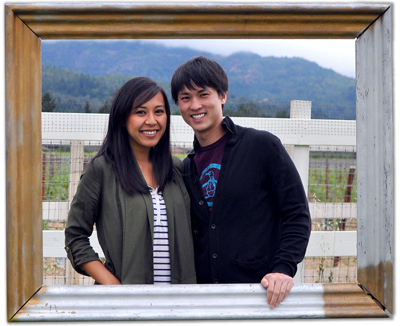 The owner is also a sommelier who speaks English, definitely knows his wine. I’d watch him converse with others, recommending different wine to suit different palettes. They’re free tapas are also creative and delicious, great with a glass or two, or three, of Rioja wine. My favorite tapas bar from our entire Granada stay. I know, nightlife – us? Yes. Well, we kind of had to — a friend from home who now lives in Madrid was DJing in Granada. I mean, what are the odds, right? So off to the clubs we went. Mae West to be exact which happens to be the biggest club in all of Spain, I think. Here’s a tip if you’re clubbin’ in Spain — the partying doesn’t start until 2am. Where we come from, the part ends at 2am, so imagine how exhausted and caught off guard we were told we’d likely be out until 6am… what?! Well, apparently all we needed was about 2 or 3 red bull vodkas and we were good as 25 again. LOL. Yes, we made it out until 6am but not without a lot of liquid courage. And not to mention the eye candy… Women in high stilettos and men with perfect hair, dressed to the nines. What a night. Have you been to Granada? What was your favorite part? I think I would have a good time just with all the tapas and wine!! Looks delicious!! 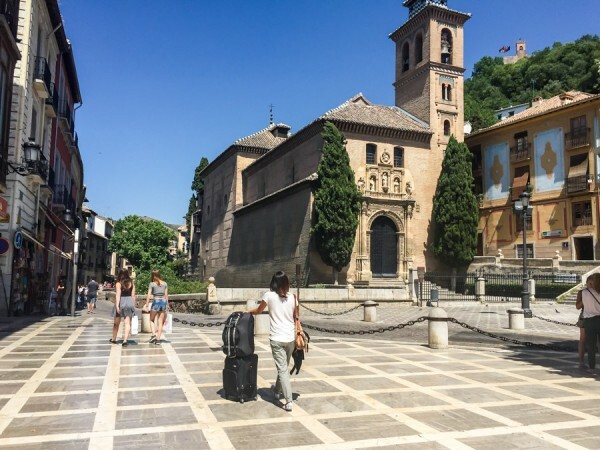 Hi… I had a really bad experience in Barcelona that put me off travelling back to Spain…but I still have a hankering to see Granada and wonder if it safe to travel there? Hey… oh no, what happened? 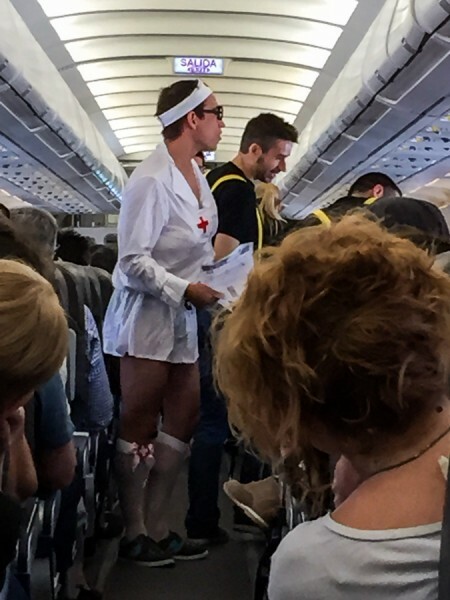 Granada is totally safe — it’s a lot smaller than Barcelona and intimate in my opinion. 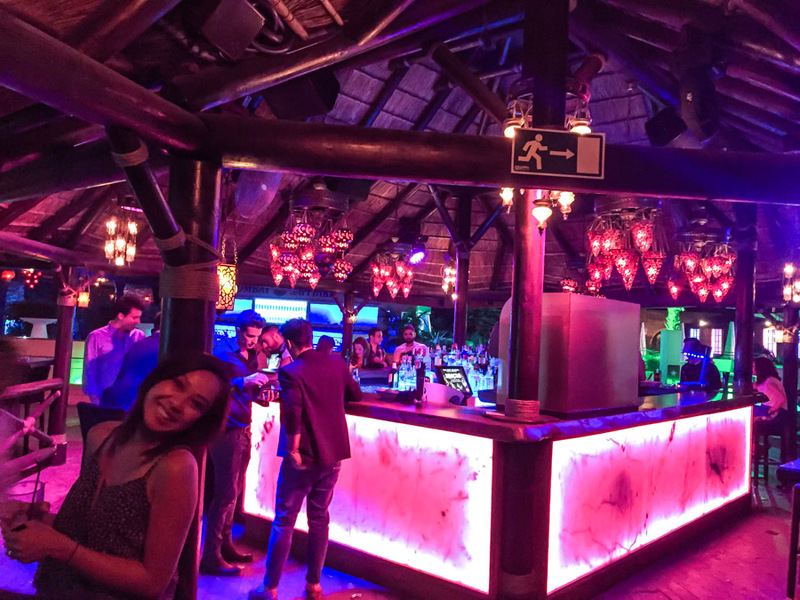 There is a nightlife and party scene, but we had no issues going out at night and clubbin. 🙂 We also really enjoyed Seville and San Sebastian too. We did not feel unsafe in any of those places. Hope you’d give Spain another go. It really is a lovely country. 🙂 G’luck!